Knesset Speaker at event marking 20 years since Operation Solomon: "The Zionism of Ethiopian Jews began long before Operation Solomon." The Menachem Begin Heritage Center held a special event on Tuesday marking 20 years since Operation Solomon, which brought over 14,000 Ethiopian Jews to Israel in 1991. This event was also an evening of appreciation for former Prime Minister Yitzhak Shamir, who served as Prime Minister at that time and initiated the whole operation. Representatives from the Shamir family were in attendance, as well as the Ethiopian community's spiritual leaders, who are called Kessim, and members of the Ethiopian community. The event was also attended by Knesset Speaker Reuven Rivlin, Education Minister Gideon Saar, IDF Chief of Staff Benny Gantz, former Chief of Staff Amnon Lipkin-Shahak, and the head of the Begin Heritage Center, Herzl Makov. It featured videos of Operation Solomon and of former Prime Minister Yitzhak Shamir, as well as an original humorous performance about the operation. 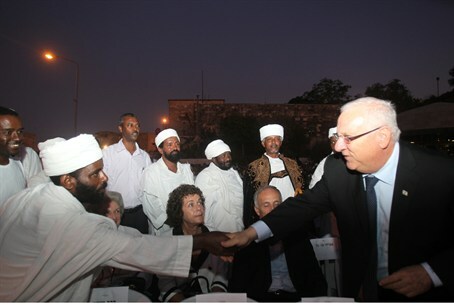 In his remarks, Rivlin said, “Operation Solomon is one of the stories that shaped the Ethiopian immigration to Israel but this is also largely an injustice that has been done to the historical and cultural heritage of this Zionist Jewish community. Rivlin praised the “resourcefulness and leadership of Prime Minister Yitzhak Shamir, together with the other planners of the operation,” and noted the heroism of the Israel Defense Forces soldiers and other security service personnel who took part in the huge operation. Ethiopian Jews who were brought to Israel in Operation Solomon and Operation Moses and thousands of others whose Jewish identity was in question, have been brought out of the backward, poverty-stricken country and have gone through orthodox Jerwish conversion procedures. They have already reached the Knesset. Special programs were set up to smooth their transition into Israeli society at a cost of millions. American Jewish philanthropic organizations, Israeli youth villages, and the national religious school system played a Herculean and major part in the ongoing integration of a community who had to be introduced to Western society as well as much of Jewish Law from scratch and whose children were all registered automatically in the religious school system.